NEW FOR 2019!!! complete refurbishment of this fabulous seaside apartment including a new kitchen in matt pale grey and all new kitchen appliances. Family bathroom refurbished including new basin vanity unit and new LVT flooring, master en suite bathroom refurbished including new basin vanity unit, new heated towel rail, new LVT flooring. The entire apartment redecorated in a palette of on trend coastal colours, new king size bed in master, two singles in the twin (NO bunks). Both bedrooms have stylish squishy new carpets in cool grey. The lighting throughout has been replaced with energy efficient/environmently conscious LED. Previous visitors to this lovely apartment are in for a real treat! A complete refurbishment (not yet photo'd) has transformed what was already a modern well located apartment into a stylish, on trend treasure that guests will be proud to make their home for their holidays. 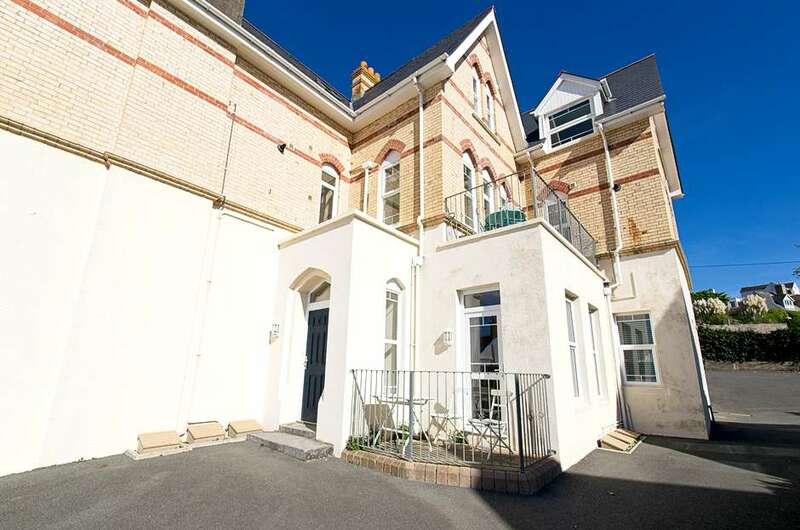 This gorgeous recently refurbished ground floor 2 bedroom conversion has a little terrace area and has an enviable position just minutes to Woolacombe’s main beach! Sleeping 4 in the two bedrooms. Location, location!! With direct access to one of the UKs best loved beaches, it's a real find. Belmont Court is all about it's proximity to Woolacombe Beach and its views across the sea. It is the first property on the right up Rockfield Road from Woolacombe’s famous Esplanade. From the living room the view across to the sea is the best in the apartment. The patio door leads to the small enclosed terrace/patio with seating to enjoy the same stunning view. This apartment is exeptionally large compared to some recent conversions and represents excellent value for money. It's square footage exeeds most in the area. The spacious living room has a lovely oak laminated floor and has two leather sofas, an extendable table with matching chairs, flat screen Smart TV with FreeSat, DVD/CD surround sound system along with a children’s table and chairs, toys, books, games, high chair etc. The master bedroom suite has a new king-size bed and is newly carpeted in a sumptuous grey carpet, has a dressing room with built in wardrobe and shelves as well as two 2 bedside tables. The newly fitted en-suite bathroom has a double-width shower, new basin vanity unit, heated towel rail and new LVT flooring. The small second bedroom has two new single beds, a wardrobe and bedside table with new soft grey carpet underfoot. There is also a travel cot and booster seat available. The newly fitted main bathroom has new LVT flooring, heated towel rail and a bath with shower over. A potty and child step are provided for younger children. The brand new stunning kitchen in matt grey has all new appliances. It has a gas hob, electric fan oven, microwave, dishwasher, washer/dryer and large fridge freezer. Additional storage in hallway. Outside there is a private storage shed for wetsuits/boards and beach paraphernalia and even an outdoor cold shower for after the beach! Allocated parking space strictly for one car only at the front of the apartment. We expect this beautiful holiday home to book fast so don't delay! This property will take a dog at £20 per dog per holiday and a security deposit of £150 will be pre-authorised and released after the holiday .